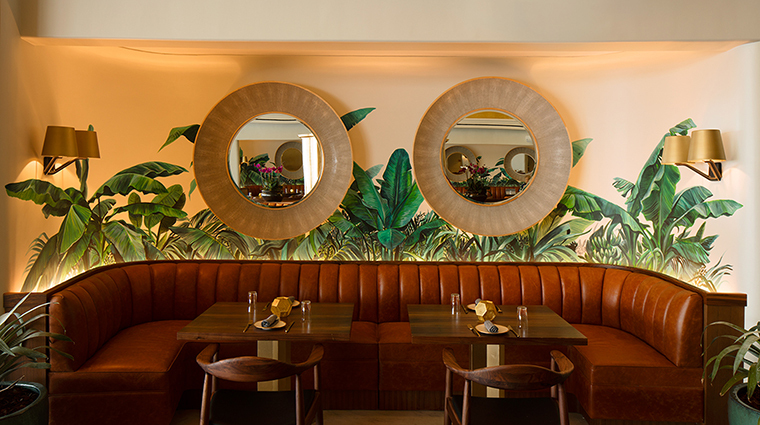 Dining at Pao by Paul Qui is a one-of-a-kind culinary experience at Faena Hotel Miami Beach, from the elaborate menu, to the beautiful ocean views, to the magnificent décor. Located in the stunningly designed Dome space of the hotel, Pao marks the James Beard Foundation Award winner’s first restaurant outside of Texas. Qui’s concept for Pao is modern Asian cuisine, with influences from a range of international flavors and styles, including his Filipino heritage, Spanish, Japanese and French. Outstanding dishes balance his expert skills and numerous techniques, including smoke and charcoal cooking for the restaurant’s binchotan service, where dishes are seared tableside on Japanese charcoal. Qui is known for his daring, bold flavor combinations and precise cooking techniques. The artful presentation on custom-designed hand-thrown stoneware by Jono Pandolfi, along with gold flatware and wood service ware, make the meal all the more delicious. The whole fish is always fresh and simply prepared to let the flavors shine. Meats such as marbled bone-in wagyu and roasted pork are lush, juicy and meltingly tender. The beverage program is overseen by Faena hotel beverage director Zarko Stankovik in a collaboration with Mayur Subbarao and Mark Kinzer, who designed cocktails inspired by early- to mid-19th-century classics. Fresh, local ingredients are utilized a lot — for example, Pao's gin and tonic features fresh kaffir lime leaves. You'll also find a deep selection of premium sakes, including Faena’s own brand. This trendy Miami eatery only serves dinner Tuesday though Saturday. A smart casual dress code invites South Beach-chic attire. Ladies will want to don a breezy skirt or dress and gents will feel comfortable in khakis and a button down. Paul Qui’s modern cuisine is in high-demand, so you’ll definitely want to make a reservation at Pao. Begin with the hearts of palm kinilaw, with thinly sliced hiramasa (high-grade yellowtail) and slivered hearts of palm prepared with coconut milk; you can also get binchotan service to start, prepared tableside on a Japanese white-oak charcoal grill. For small plates, the chilled peanut gazpacho with charred eggplant puree and pickled bok choy and curry oil is outstanding, as are the panko-crusted pork katsu sando (kurobuta pork milanesa, karashi mustard, and sweet and sour fruit sauce on pan de sal, a Filipino sweet roll). The signature Unicorn dish is not to be missed — sea urchin, grilled sweet corn pudding, calamansi, chile de árbol and sake aioli. Pair this with one of the rices, such as the pork adobo with fried duck egg or the short rib with wild mushrooms and pickled vegetables. Desserts are sublime. The cheddar cheese ice cream sandwich is a surprising delight — light waffles hold together a wedge of Cabot white cheddar ice cream with goat's milk dulce de leche. There is nothing low-key about Pao. Designed by Alan Faena, the oval-shaped Dome space housing the restaurant is modern and sleek, accented with whimsical elements of nature throughout. Gold leaf covers the walls and the ceiling. Floors feature a herringbone wood pattern surrounded by white marble. Gorgeous walnut wood tables, dark brown leather banquettes and midcentury-style chairs add contrast. A Carrara marble bar with mirrored back shelves also offers ample space to gather or dine. One of the most striking details is Damien Hirst’s Golden Myth, a painted bronze and gold-leaf unicorn sculpture at the center of the restaurant. Outside, the courtyard is decked out with white marble-topped tables and white chairs with white-and-gold cushions.